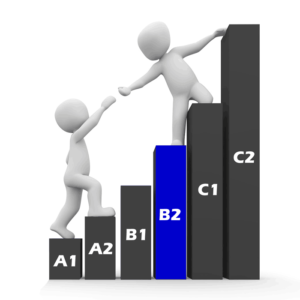 English level B2 (Upper Intermediate) is the fourth CEFR English language level. We provide the international CEFR description, followed by study targets and links to our free online English training. understand the main ideas of complex text on a variety of topics, including technical discussions in your field of specialisation. Here are our study targets for the key components of English level B2. You can also click on different items for free online English lessons, which include descriptions of each language point, examples and quizzes. You can also develop faster by taking English courses with qualified English teachers. English for Work. This includes Business English, Legal English and more. English examinations. You can also prepare for one of the internationally-recognised English proficiency exams, and some of the most popular and the Cambridge exams and IELTS.